I’ve just been watching the Great British Bakeoff Final, so what better theme for a post than that of baking? We can start with the obvious: Baker Street, which is probably most famous as the the literary location of 221b – the residence of that brilliant detective, violinist, cocaine user, and misogynist Sherlock Holmes. Number 221b was never a genuine address in Baker Street, and was carefully chosen by Conan Doyle for that very reason. That has not stopped people over the years from writing to Holmes: the first letter was in 1890 when an American tobacconist wrote asking for a copy of Holmes’s monograph ‘Upon the Distinction Between the Ashes of the Various Tobaccos’, which was referred to in various cases. Whether or not he was serious, he started a craze and other people were soon also writing to Sherlock Holmes. These letters were, for many years, fended by the Abbey National Building Society whose Abbey House stood on the spot where 221b would have been. At one time, up to 400 hopeful correspondents would received a polite reply explaining that Mr Holmes had vacated his room and his current whereabouts were unknown. The street stands on the Portman Estate – in 1553 Sir William Portman bought nearly 300 acres of land in the area; 200, years later development of the Portman estate began. The name does not come from any prevalence of bakers in the area. It commemorates a person called Baker, though opinion has been fiercely divided as to which particular Baker. Peter William Baker is one candidate: he was the Portman agent; others are Sir Edward Baker of Ranston was a friend of the Portmans; John Baker was also said to be a friend of the Portmans; and Sir Robert Baker, a Bow Street magistrate who helped quell the riots at Queen Caroline’s funeral in 1821. Next we have Pudding Lane, with a baking connection: the lane is most famous for being where the Great Fire of 1666 first broke out, starting in the house of a man called Faynor (or Farryner), the king’s baker. The lane was a narrow one with pitch-covered wooden houses and led to the riverside warehouses full of oil and combustible materials such as hay, coal, and timber. Once the fire got going, it caused the destruction of thirteen thousand hoses and fourteen streets – though, amazingly, only eleven deaths. Incidentally, the pudding part of Pudding Lane is nothing to do with baking or desserts: the lane, once part of the meat centre of London, was on the route where ‘puddings’ – parcels of offal – were transported to be thrown into the river. Piccadilly can also be brought into the baking theme, although the name, first recorded in 1623, may come from a ‘pickadil’, defined as “that round hem or several divisions set together about the skirt of a garment. The popular theory is that the name of the street itself arose from one Robert Baker, an early 17th century tailor, who bought a plot of land in what was still far from being central London. He built a large house and, four years after his purchase, he was referring to himself as a ‘Gent’ – a source of amusement to those who thought of tradesmen as being tradesmen and not gentry. The house was thus dubbed ‘Pickadilly Hall’ in honour of those items that had brought him his money (and, presumably, to remind him of his origins). The name, as that sort of thing does, gradually stuck. Oh, yes, and of course there is Bread Street, which gets its name from the fact that it was one of the many ‘shopping’ streets, connected with the Cheapside market, which were named for their speciality. Edward I decreed in 1302 that bakers could sell bread only from this street. Before that, the “leprous women of St James’s” were allowed a tenement here in 1204; part of the street was later destroyed by fire in 1263. Incidentally, I haven’t forgotten the challenge thrown down by one reader to be fair regarding the World Series and mention the Dodgers, aka the losing team. Did I mention the Red Sox won? I haven’t been able to find anything Dodger-like yet, but the closest I can come for now is another Oliver Twist character: Bill Sikes. In Dickens’ time, Saffron Hill was an evil slum, and features in Oliver Twist: “in an obscure parlour, of a low public-house, in the filthiest part of Little Saffron Hill…sat, brooding over a little pewter measure and a small glass…Mr William Sikes”. The wonderful website Party Excuses says that today is National Pierogy Day, and who am I to argue? The pierogy, or pierogi, is part of the Polish cuisine, so it’s not too much of a stretch to Poland Street in London’s Soho district. The street was once part of a patch of land used as horse pasture by its 16th-century owner and it would appear that Poland Street is on the site of what was once called Little Gelding’s Close. Early in the 17th century, Little Gelding’s Close, along with 19 other acres of land, was sold to Robert Baker, the builder of Piccadilly Hall. The name of Poland Street first appears in 1689, deriving from an inn called King of Poland. It is assumed that the pub was named in commemoration of the victory of John Sobieski, King of Poland, over the Turks in 1683. The poet Percy Shelley once lodged in Poland Street. There is a nearby street once called King Street, presumably also in commemoration of said victory. It has since been renamed Kingly Street and renaming of streets leads us nicely into Sigourney Weaver. Today marks Ms Weaver’s 65th birthday and, yes, there is a connection, however tenuous, between that fine actress and a street in London. Well, ok, there is a Weaver Street (near Shuttle Street) in Spitalfields, and those streets do reflect the fact that the silk weaving industry was once predominant there. But that’s too easy. Another weaver connection is that of Petticoat Lane, about a mile from Weaver Street. Despite the fact that the lane was once a “filthy and wretched street”, according to James Elmes, who wrote A Topographical Dictionary of London and Its Environs, it did once benefit from nearby pleasant fields. The gentry flocked to build their houses in these relatively rural surroundings, but were soon ousted by an “influx of the French Refugees in the reign of Louis XIV, it became the residence of the lowest class of their weavers”. So the name, dating back to the 17th century, could be from the silk weavers, who would have made petticoats, and who settled in the area; or from the secondhand clothes dealers who had begun to trade in the lane even back then. By the 19th century the lane was, said Henry Mayhew, a 19th-century social researcher, journalist, and playwright, “essentially the old clothes district”, and to look down the lane at the time was “to look down a vista of many-coloured garments”. The reason for changing a perfectly good name is, presumably, Victorian prudery that deemed women’s undergarments an unsuitable item for a street name. This wasn’t the first time its name was changed, however: early names were Berwardes Lane (from a local landowner) in the 14th century and Hog Lane in the 16th century (because, like Huggin Hill, it ran through a pig farm. Oh, yes, it was called Middlesex Street because it once formed a boundary between the city of London and the country of Middlesex (which now exists in a different form). 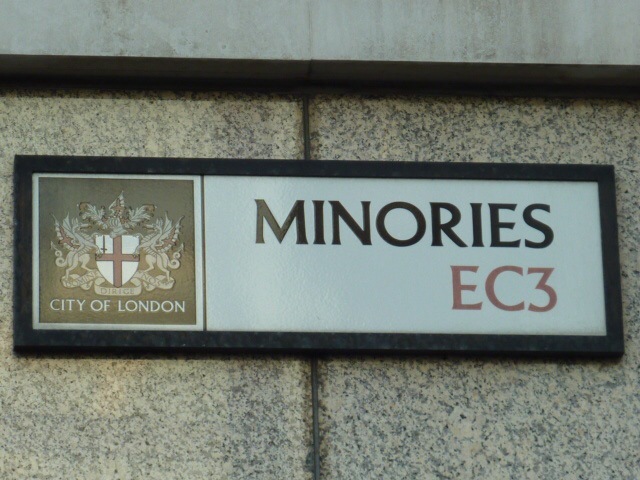 Following on from our last post about when a street is not a street, there is another class of street name and that is the singleton, or one-word name, such as Cheapside, Haymarket, Houndsditch, Piccadilly, Strand, and many others. Piccadilly is a fun one: this name, first recorded in 1623, has provided many a guessing game for London historians. In the 17th century a ‘pickadil’ was defined as “that round hem or several divisions set together about the skirt of a garment or other thing; also a kind of stiff collar, made in the fashion of a band”. The English word, it is argued, derived from the Dutch or Flemish ‘pickedillekens’ (trifles), translated first into French as ‘petits bords’ and then into English as ‘pickedilloes’ or ‘small edges’. The word is, today, more commonly seen as ‘peccadilloes’ – trifling misbehaviour. The popular theory is that the name of the street itself arose from one Robert Baker, an early 17th century tailor, who bought a plot of land in what was still far from being central London. He built a large house and, four years after his purchase, he was referring to himself as a ‘Gent’ – a source of amusement to those who thought of tradesmen as being tradesmen and not gentry. The house was thus dubbed ‘Pickadilly Hall’ in honour of those items that had brought him his money (and, presumably, to remind him of his origins). The name, as that sort of thing does, gradually stuck. This theory, as theories do, has its supporters and dissenters. There is a slight variation on the theory: that it was a tailor called Higgin who built the house, which was then taken over by Baker. The serious dissenters say that the area was referred to by that name before Baker (or Higgin) bought his land and built his house: it is mentioned in John Gerard’s Herball. Gerard refers to a flower that “groes upon the dry ditch bankes about Pickadilla”. With due deference to Occam and his razor, it should be pointed out that the simplest theory is that the area took its name because, for a long time, it was on the outer fringes – or hem – of London and that Mr Baker’s house and occupation were a happy coincidence. It’s about two and a half weeks until I take part in the London Moonwalk 2014, so how about a look at Man in Moon Passage today? As with so many of the more delightful of London street names, the name of this little alley off Piccadilly probably comes from an inn sign. People all over the world have been looking at the man in the moon for a very long time, and on the inn signs he was often depicted with a bundle of sticks, a lantern, and a dog. There are various theories about the identity of this particular man in the moon. One is that he is the man, mentioned in the bible, who was discovered gathering sticks on the sabbath. Another nominee is Cain; in his case the dog is the ‘evil spirit’ and the sticks are a thorn bush symbolic of his fall. More poetic is that the man in the moon is Endymion, a handsome shepherd, who was carried off to the moon by Diana. Perhaps the dog was a sheep dog and the sticks representative of a shepherd’s crook. If you want to support Walk the Walk and its efforts on behalf of breast cancer charities, you can sponsor me by visiting my fundraising page here.